If you’ve walked around the floors of the big casinos in the last couple of decades, you’ve probably seen a new table game on the scene called Let Em Ride. While many salty casino game aficionados turn their noses up at new casino games, this one is a real winner. While it is extremely easy to learn, the strategy is a touch more involved, so I will lay it all out for you right here in the Let Em Ride Strategy Guide! With extremely simple game play, and a very straightforward betting strategy to match, Let Em Ride Poker is a fantastic game for beginners and old salty casino games players alike. All you need to be successful in this new casino game classic is knowledge of how poker hands are ranked, this strategy guide, and a good clicking finger. The object of the game is to make a poker hand of at least a pair of 10’s or higher. The better the poker hand you make, the more you get paid for the winning hand. In this way, it is much like playing video poker, except this game is played at a table with real cards and casino chips. The easiest way to learn Let Em Ride Poker is to just play a hand, so let’s give it a try! At this point, the original $5 you bet is a given, there’s no getting it back. However, you now get to choose whether you want to raise the bet on this hand another $5 before seeing the next card. Remember, the goal is to get at least a pair of 10’s or better, so we only want to raise if we think we have a good chance of making at least a pair of 10’s. If I thought I had a good chance of making at least a pair of 10’s, I would click on “Raise”, which would double my bet before showing the next card. Since making at least a pair of 10’s does not look very likely at this point, I am going to simply click on “Continue” to see the next card without raising the bet. After clicking on “Continue”, I now have a 6 of hearts. At this point, I have to make the same choice as I made above. Should I raise my bet or should I stick with my original $5 bet? The final card is a King of hearts. Since I didn’t make at least a pair of 10’s, the house wins, and the game can be started over by clicking on “Rebet”. While I didn’t win on this turn, the potential to win money quickly is very high. Let’s say I had a pair of 10’s from the first 3 cards. This way, I would have been 100% sure that I would win in the end, and would have clicked on “Raise” on each turn. By clicking on “Raise” on both turns, I would have bet a total of $15, and would have won at least $15 from the pair of 10’s (or I would have won even more if I got a second pair or another 10 to make three 10’s). As you can see from above, the game is fairly simple… raise when you think you will make at least a pair of 10’s and click on “Continue” when you think you won’t. The whole trick of the game lies in knowing when you should raise, and when you should hit “Continue”. Well you’re in luck, because in a couple of days I will share a Let Em Ride strategy with you that will ensure you make the perfect bet every time! Check back later this week for the complete Let Em Ride strategy guide. If you want to get started playing Let Em Ride yourself, simply click on the “Play Now” button below to download an absolutely free Let Em Ride game. If you think you can come up with the perfect Let Em Ride strategy before I post it later this week, write it in the comment section here and you may win a nice exclusive prize! Good luck! 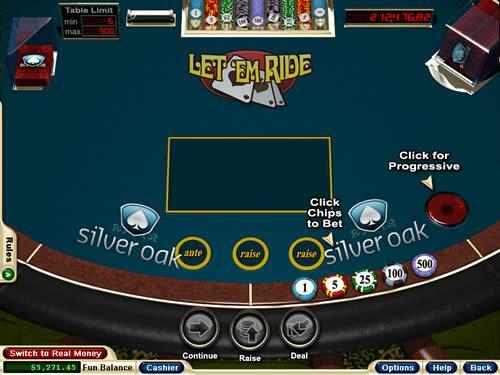 Go to the Silver Oak Casino site for complete guides on Let Em Ride and over 130 other online casino games.